EXTREME Seafood in Sri Lanka – We’re going DEEP for the BEST Seafood and Mud Crab of Colombo! If you love Seafood and HUGE Crabs and SPICY Curry, Sri Lanka is your HEAVEN! Today, I’m (Trevor James, The Food Ranger) taking you DEEP in Colombo for THE BEST Mud Crabs and GIANT CRAB CLAW LOLLIPOPS and SEAFOOD!! Today, we’re going for a HUGE MUD CRAB Adventure of Colombo and Negombo in Sri Lanka! 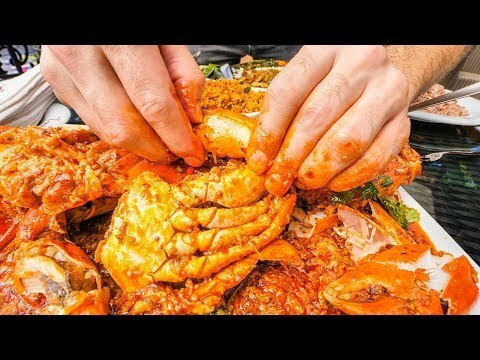 You’re going to love this GIANT Crab Adventure! We have 4 different varieties of crab in Sri Lanka! We’re bringing YOU with us as we travel in Sri Lanka to taste the BEST food and street food in Sri Lanka! There is so much variety to Sri Lankan cuisine and Sri Lankan food, and we are taking you with us to taste it in this Sri Lankan food series! First up, we’re traveling to the Seafood market and Mud Crab lagoon outside of Colombo. Here, in Negombo, there’s a huge fish market where you can purchase fresh seafood and delicious mud crabs. The coolest part is how you can visit the mud crab “nest” and purchase one and then bring it to a local Sri Lankan restaurant to cook for you. We found 2 PLUMP mud crabs and brought them to the old rest house in Negombo to cook up Negombo style. It was full of Sri Lankan spices like chili and garlic and pandan leaves and their secret peppery spice mix. We also had other famous Sri Lankan foods like string hoppers, dhal, coconut sambol AKA pol sambola and Sri Lankan cuttlefish. It was all so delicious! After that, we traveled to Upalis restaurant in downtown colombo for a delicious chili crab. This was another big mud crab that was cooked in a spicy Jaffna style spice mix and a sweet tomato sauce. It was very delicious as well! It was also served with a delicious Sri Lankan mutton curry and a rice and curry banana leaf plate! Sri Lankan food is AMAZING!! After this, we’re going to another MUD CRAB restaurant, the Station LK and eating a different Sri Lankan style mud crab, cooked with curry powder and curry leaves and more Jaffna style spices! This one was INCREDIBLY delicious!! It was also served with a HUGE LOBSTER cooked “black coconut” style! It was sweet and super tasty! And to finish our MUD CRAB TOUR, we’re going for a famous Sri Lankan street food, the isso wade and Kakkulo Wade, AKA crab and shrimp cakes fried with a lentil and gram flour batter. Super delicious! We’re going for more street food around the world!